"A delicious scramble great for any meal of the day! This is a Seattle favorite!" Heat the olive oil in a large skillet over medium-high heat. Add the ground beef, and cook, stirring to crumble, until no longer pink, about 8 minutes. Pour off any excess grease, then stir in the garlic, onions, and mushrooms. Reduce heat to medium, cover, and cook until the onion has softened and turned translucent, about 5 minutes. Stir in the nutmeg, oregano, spinach, salt, and pepper and cook until the spinach is heated through. Reduce heat to medium-low, and make 6 egg-sized indentations into the beef and spinach mixture. Crack the eggs into the each indentation, then cover, and continue cooking until the eggs are done to your liking, about 5 minutes more for medium. 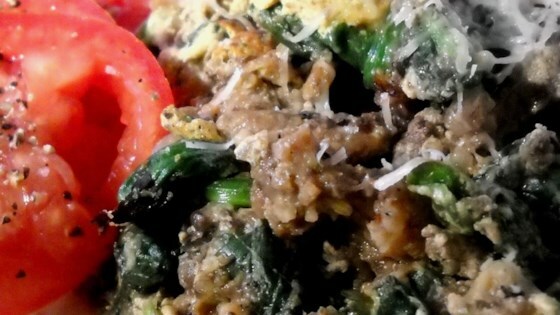 See how to make a classic San Francisco ground beef and spinach scramble.